Blue Potatoes Why not end the season with fabulous colors? These are versatile and work for any potato dish. They bake particularly well. Beets These young beets are tender. Store them in a tightly sealed bag. I love roasted beets on a spinach salad with balsamic dressing and walnuts. Also try grating them with carrots for gorgeous raw salad. Carrots Carrots can be frustrating to grow. They are slow to sprout and require a lot of weeding to get good roots. 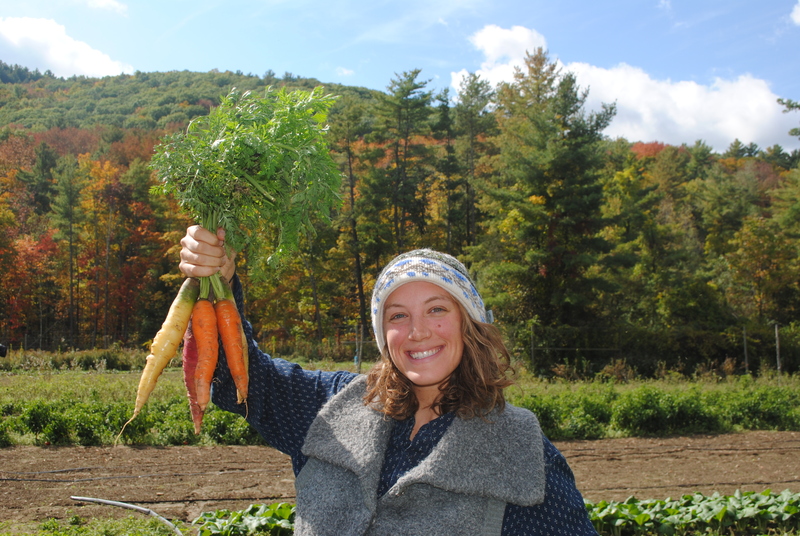 We are proud of this season’s beauties and we know they are a favorite among members. Long Pie Pumpkin This heirloom has an uncommon shape but it really is the perfect pumpkin for Thanksgiving pies. The texture is creamy and the flavor rich. I have also made amazing curries with it. Remember that pumpkin and squash seeds are incredibly nutritious so roast them up for your omega 3s. Butternut Squash I made a simple, delicious soup the other day by roasting a butternut, peeling off the skin, and blending it up with veggie broth, a sliced green apple, a little curry powder, salt, and pepper. I added squash seed milk that I had made in a soy milk maker, but you could use regular dairy or soy milk. My two year old calls it “yellow soup” and can’t get enough of it. Onions One advantage of having had such a dry field season is that our onions cured beautifully and are still very high quality months after harvest. Toscano Kale This dark green variety is of kale is great for simple steamed greens, kale chips, massaged kale salad, or for adding to soups and omlets. Spinach Eat it raw in spinach salad or cook it down into your favorite dish. It freezes well when lightly wilted. I love making creative spinach dips and using wilted spinach as fillings for filo dough or dumplings. Thanksgiving appetizers? Creamed spinach side dish? 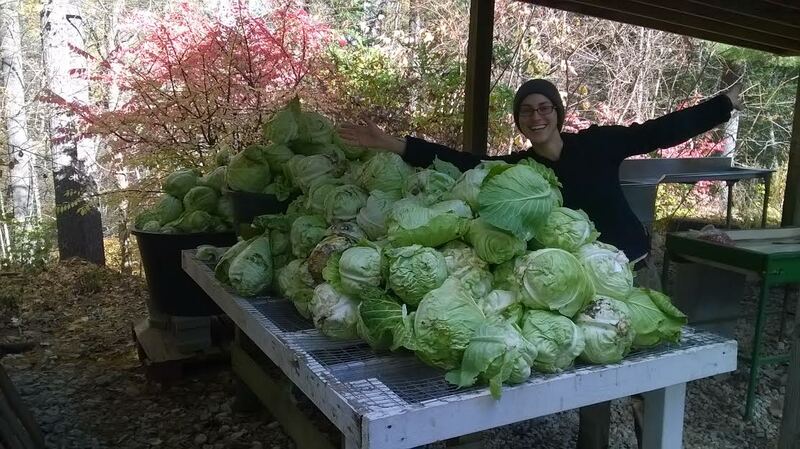 enough left over to distribute to the CSA. Watermelon Radish This heirloom radish is fairly mild. Before long-distance produce shipping, people relied on this very kind of storage veggie to keep their vitamins up all winter. It is gorgeous shredded for salad, sliced up for eating raw with dip, roasted in the oven, or sauteed. Jester Acorn Squash This specialty squash is a little sweeter and dryer than the variety you got last week. The skin is thin and edible, although many people prefer to send the peel to the compost. I can’t recommend simple squash prep enough- slice in half, coat in a little oil, roast for about an hour at 350 and- wallah! Purple Top Turnips These storage turnips are a part of our weekly cholent (traditional Shabbat stew) recipe here at the Isabella Freedman Jewish Retreat Center. They also make delicious creamy soup and they roast beautifully. These will store all winter if kept carefully in the fridge. Onions These have been storing very well and we’ll have plenty more for next week. Rainbow Carrots We considered registering these giant carrots in some kind of state-fair-large-vegetable competition, but we decided they would be better off in your kitchen. Green Cabbage This is the only “green” that stores well and you can keep it in your fridge for weeks until you are ready for that perfect slaw, borscht, curry, stir-fry, braised mix, kraut, or other dish. Broccoli Steamed broccoli greens are the hip new veggie trend. 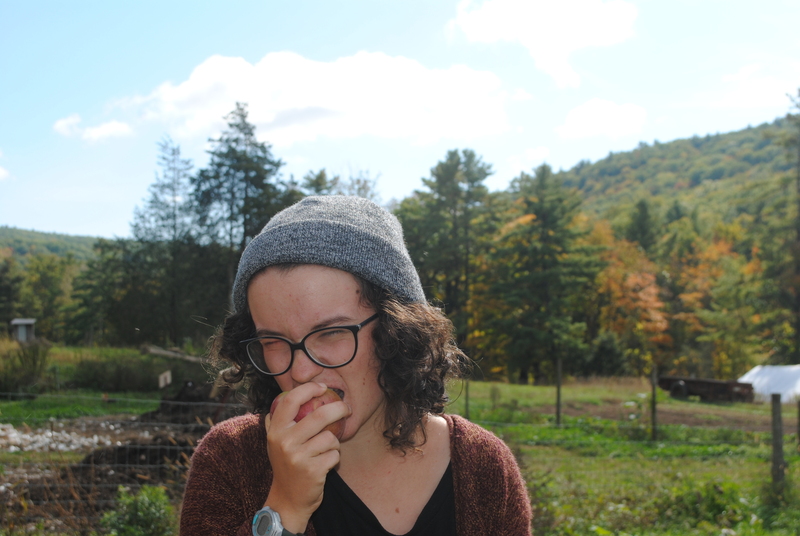 This is one of the few veggies in this week’s share that should be eaten right away. Salad Mix This mix of spicy mustard greens and mild baby spinach is triple washed and ready to be dressed! Next week we should have enough spinach for all the shares to get a big bag of just spinach. Garlic We save all our own garlic “seed” in the form of cloves from the previous season for fall planting. Now that we have planted the 2016 crop we had enough left over to distribute for these last two weeks. 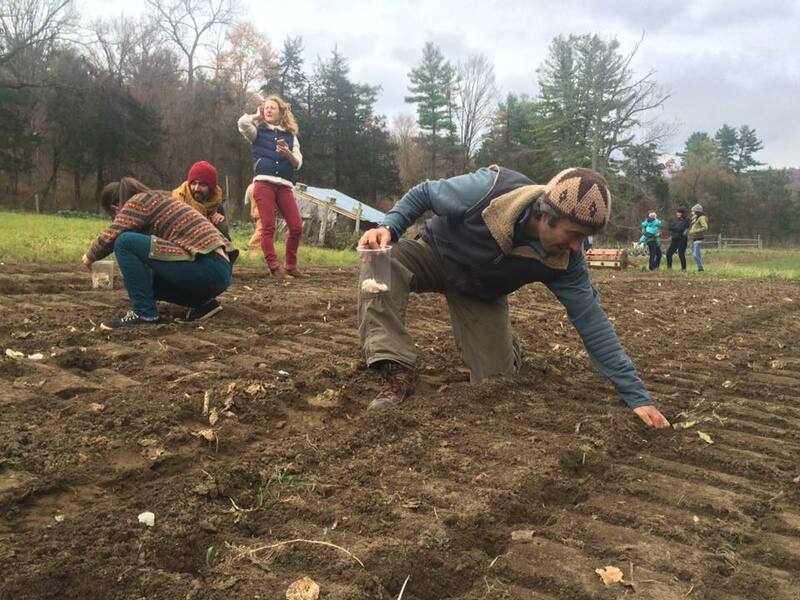 Planting Garlic in the November Soil- These cloves will send out little roots, hang out all winter, sprout green shoots in spring and be ready for harvest in July 2016! 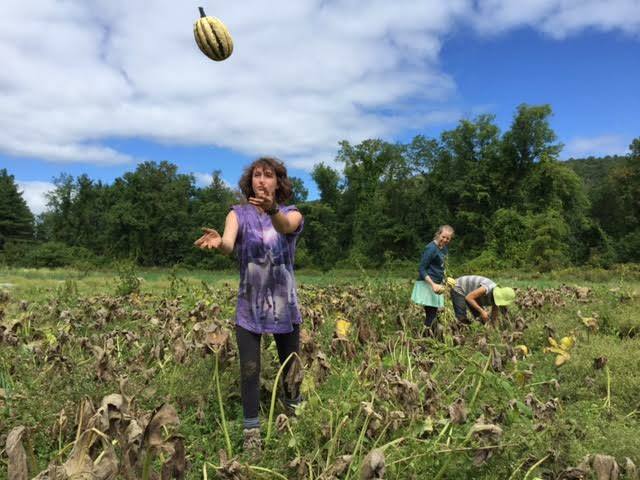 Register for your share of the 2016 harvest on Thursday to secure your garlic crop for next year. 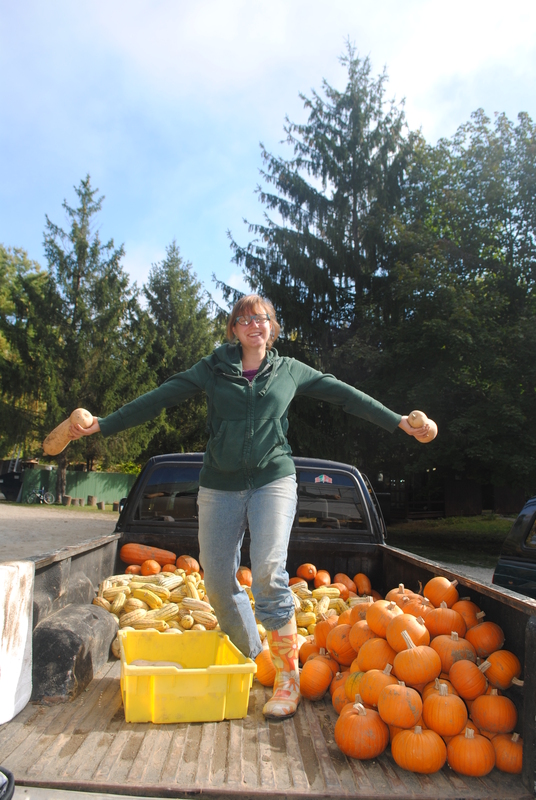 JOIN US NEXT WEEK FOR THE FINAL CSA PICKUP and EXTRAVAGANZA! A and B week shares will both pickup. Please invite your friends, family, and coworkers to our celebration! 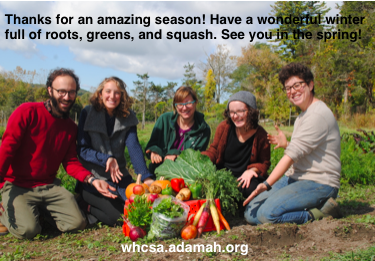 We’ll have ongoing sauerkraut workshops, cider pressing, Adamah market, music, and crafts! 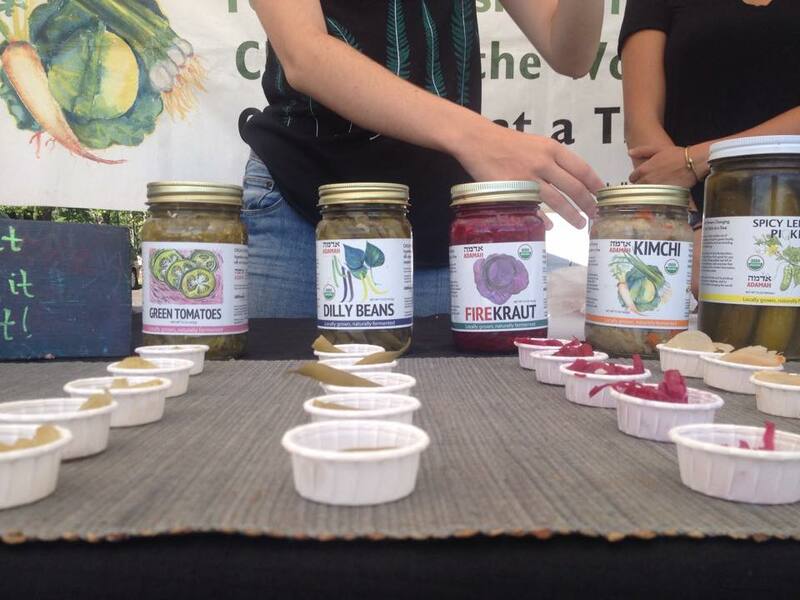 Buy Our Delicious Pickles at Thursday’s Market! 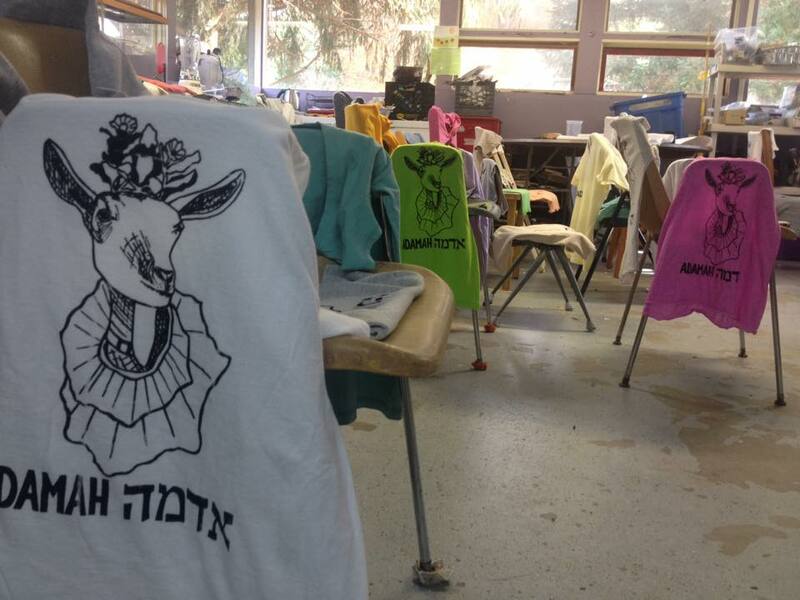 Check Out the Adamah Tee Shirts We’ll Have for Sale on Thursday! Click on any blue words or phrases to link to recipes! Apples This is the last week of apples for the season. Pie Pumpkins Decorate with them until the end of the month, and then make a November pie! I like to roast pumpkins in the oven and then scoop out the innards for blending into pie filling or soup. We had to include some smaller pumpkins in order to have enough for everyone to get three so hopefully you got a mix of sizes. Potatoes This yellow fleshed variety is called German Butterball and it has a creamy texture with fabulous flavor. Always store potatoes in the dark to avoid greening. Red Onions These aren’t as big as our prize winning yellow onions but they are of a respectable size with incredibly rich color. Rainbow Carrots This gorgeous mix of big ‘ole carrots will store well. Broccoli Broccoli greens are delicious and can be used just like kale or collards, making this sort of a two in one item! The broccoli head’s nooks and crannies make it a bit tricky to wash thoroughly. If you want to ensure it is pest-free, submerge in salt water for a few minutes after chopping to wash off any stowaways. Tomato This is the very last week of tomatoes for the season, as the plants died in the deep freeze this week. Thanks for a great season tomato plants! Salad Mix This mix of mustards, lettuce, and baby spinach is triple washed and ready to eat. Mint Try a little mint in salad, curries, or tea. Adamah: where in the world?